I would first Beast Wash your unit with our Beast Wash. Next I would start buffing her out with our one step RV Finish Rejuvenator with Wax. The Beast Wash will remove any wax residue and give you a clean surface to work with. You can than start buffing your rig by machine. Look at our kit for $99. 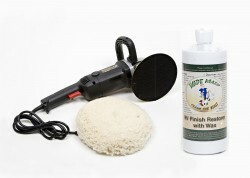 That includes a buffer and everything you will need for buffing out your rig. This is a big job and I want you to know that when working with a white fiberglass finish you will always have some type of buffing swirls. Your work will determine what kind of swirl pattern you have and how noticeable it is. With a little practice you can do this yourself. Our product if properly used will work excellent on your project. One of the many things we do with our RV Compound that is different is we make it white. Most compounds are an orange color leaving a tint in your white finish. 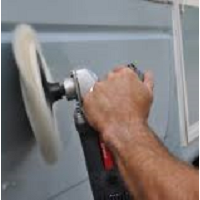 Watch our videos on buffing with a machine. Just take your time, work small areas to a shine and enjoy the ride. After all the ‘R’ in ‘RV’ stands for Recreation! I have a 36 foot Carriage Cameo fifth wheel trailer that has baked on old wax that has bad swirl marks. There is also some oxidation. Do you have a product that will remove the old baked on wax and swirl marks and leave a decent shine? I took it to a local car detailer and he did not want to do it – he only uses a one step finish restorer wax and he felt it would not remove the old baked on swirl marks. I had the impression he was not wanting to tackle it. Do you have a product an amateur could use?